You must consider that private RR's were in terible financial shape and that they needed the money to stay afloat. Passenger RR's decline in the 50/60s was due to the rising popularity of Air-Travel. Yes, it is a shame that NYP was lost but it's demolition saved Grand Central and many other buildings. As Jackie Kennedy got involved, as you mentioned, and the NYC Landmarks Preservation Commision was born. 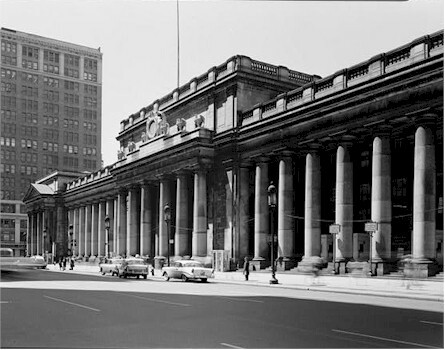 BTW, the picture of Penn Station shown here was taken from the N/E corner of 33rd and 7th. Looking south. 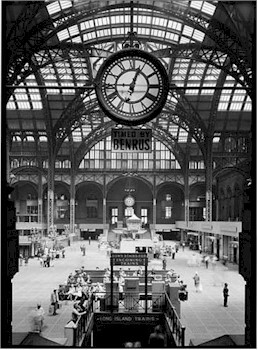 I regret that I have no memory of Pennsylvania Station before it was turned into the overcrowded, overheated completely underground travesty of a railway station it is today. The geniuses at the Pennsylvania Railroad (mostly our grandparents' generation) decided that the railroad only needed to keep the track level and concourse level and they sold the airspace above. Fortunately for New York, Jacqueline Kennedy Onassis was a resident of the town when discussion started about demolishing Grand Central Terminal. She was instrumental in saving it from the wrecker's ball.